May we suggest these ideas? 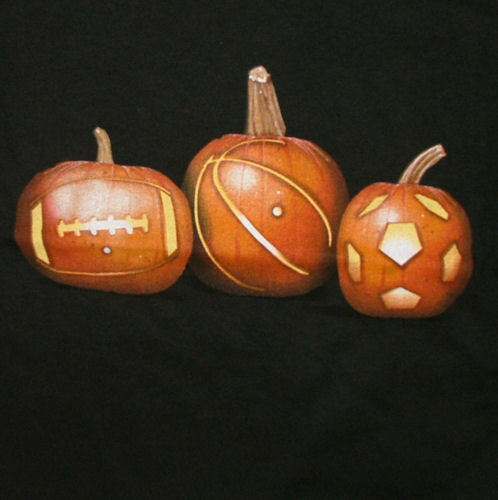 Have a safe and happy Halloween from everyone at CoachDeck! This two year-old has waited his entire life to see the Giant’s win a World Series. Never thought he’d see the day. Funny article, courtesy of, of course, The Onion. More great stuff from our partner, PHIT America.org. According to various studies, workers who are in shape and healthy are far less likely to miss work than those who are not fit. Companies that do things such as provide healthy meals and gym memberships to workers see a productivity boost that more than offsets the associated costs. Read the article here. I was talking with one of my son’s former baseball coaches who is now coaching college women’s softball. I asked him what the difference was between coaching the two genders. He said, “Guys need to play well to feel good. Girls need to feel good to play well.” It is a great line. But is it possible that the explanation is that simple? As a father of three sons and a daughter, I’ve coached a lot more boys than girls. But I have coached enough girls in soccer and softball to know there are some differences, but there are also similarities between them. I was involved with my boys teams all the way up through high school, but by the time my daughter was thirteen she was playing soccer full-time and had professional instruction. So while I don’t have personal experience coaching teenage girls, this is what I have observed with the younger ones. Girls, by nature, are more communal. I’ve looked into the dugout during games that I thought were pretty important and observed girls sitting on each other’s laps. Or braiding a teammate’s hair. I had to to make an adjustment to that. Boys were expected to be focused 100% on the game, to be displaying their game face. With girls, I guess it is important that they have their game hair. This is not to say that girls want to win less or don’t try. I coached many girls who had more intensity than some of the boys on my teams. But the male players I oversaw seemed to be more about winning and performance first, and friendship second. Many of the females were the reverse. I also remember the first time I coached girls of six and seven years old, after having done so previously with three sons, and observing how much more quickly the girls learned things and how I never had to correct their behavior. That’s a big difference. Through all the seasons I coached girls, I don’t remember ever having to ask girls to pay attention or stop fooling around. Boys were more of a challenge in that regard. Emotions are also a distinction between the genders. I once had a young lady on my softball team, Tracy. Phenomenal player. A catcher. The only girl I ever coached who legitimately could have played with the boys in the local Little League and made the all-star team – at least defensively. She was so good that I felt I could push her a little more than some of the others, and I expected more. But one time she made a mistake on a throw that cost us a run and, while I didn’t raise my voice, I expressed my disappointment. And she shocked me. She started to cry. I had thought she was tough as nails – impervious, but I had unintentionally crossed over a line. I’d reprimanded boys much, much more sternly and never gotten waterworks, but this mild rebuke reduced Tracy to tears. Thinking about it now, is it possible that I never had that reaction from any of the boys I coached only because boys are taught early in life not to cry? Maybe some of them were crying inside. I sure hope not. What got me thinking about this topic is my daughter’s soccer team. She’s a junior in high school now. Her team is one of the best in the country, recently ranked third nationally, and all of the girls have committed to Division One schools to play in college. So this isn’t a friendly rec team. They have a new coach and I have to say that through all of my years of my sons’ sports – football, baseball and basketball – I have never seen a coach who yells like this guy. And I’m not talking about exhorting the girls to do better. I mean angry, aggressive, non-stop criticism of play during the game. A few weeks ago, as I walked up a couple minutes into the start of a game, one of the other players’ dads came straight over to me and complained that the coach had been yelling at his daughter and my daughter before I arrived. I laughed a little hoping to lighten the tension and said I thought that was good for them. He didn’t agree or think it was funny. His comment was that these were girls, not boys and you had to handle them differently. I mentioned that they’re all going to be playing high-stakes soccer in college soon and that they probably weren’t going to be coddled there. But he was not interested in that point of view and stalked off. Fast forward to the next game. The coach was on all of the girls again, but especially this guy’s daughter. He really called her out multiple times. The fans, on the opposite side of the field from the players and coaches, got to hear this dad calling the coach every name – and I do mean every name – in the book. I ignored him. But several parents approached me and asked what I thought. It seemed that the opinions were split pretty much down the middle. Some felt the guy was being too hard on the girls, others said that they didn’t mind his attempts to toughen them up. At one point our coach got so angry at this player that he switched her to his side and screamed, “Come over here so I can keep an eye on you!” I have to admit, in light of the way he’d been treating her all game, even I thought he might have finally gone too far with this remark. But then, less than a minute later, the girl made an incredibly aggressive play, stole the ball and took a world-class sprinter run towards the net. Only a phenomenal save by the keeper prevented it from being one of the most unbelievable goals I’d ever witnessed. Would she have made that play regardless of the “coaching” she’d been getting? Or had the coach found a way to tap into something deep inside her? I don’t know. Maybe the timing was coincidental. And, if you’re wondering, I asked my daughter if the yelling bothered her and she looked at me like I was crazy and without hesitation said, “No.” But then again, so far, she isn’t getting nearly the dose that some other girls are. No one – boy or girl – likes getting yelled at, I’m sure we can all agree with that. And everyone does enjoy being praised. And I’m sure we would all agree also that a great coach finds a balance between negative motivation and positive reinforcement. It can’t just be all one or the other. But when it comes to techniques for working with young athletes a great coach knows how to get the best out of everyone, regardless of gender. Don’t miss tomorrow’s OnDeck Newsletter. Sign up here to receive your copy or read previous issues! Below is Part Two of Alan Jaeger’s Off Season Workout. If you missed Part One, click here. Once you get to your desired distance and feel completely stretched out, it is time for the “pull down” or downhill phase of Long Toss (if that is what your workload is that day). This is the time when you would normally come “back in towards” your throwing partner if you were outdoors. So, to simulate this pull down phase into the net imagine that you were coming in toward your partner in 10 foot increments with each passing throw (so it would take you 24 throws, or 240 feet, to go from 300 feet to 60 feet). With each throw, simply lower your focal point on the net by one degree or so, and keep lowering this focal point until you are back to 60 feet. Once back at 60 feet, you may begin to notice that in order to maintain your furthest throw that day (e.g. 250 + feet) you actually have to aim lower than chest height to keep the ball on a line. This is because you are compressing a great deal of distance (250 + feet) into a very short space (60-65 feet). Another way of saying this is to aim 20-30 degrees downhill (your partners waist) and make sure you are maintaining your furthest throw (by not decelerating) and the ball should end up no higher than chest height or so. This lower focal point will teach the body (mind) how to be explosive downhill and how to not decelerate. And if you’re a pitcher, and you want to work on getting even more leverage out in front, simply lower your focal point down to your throwing partners shins or toes (see jaegersports.com/articles) and see if you can get it to where the ball is ending up at knee height. Again, it all comes down to lowering your focal point and not decelerating in order to maximize the compression of your furthest throw into your shortest throw; to be in the best position possible to have optimal leverage downhill with explosiveness. If you are a position player you can aim a at your partners belt line (which should equate to the ball ending up at your partners chest if done correctly).